We have a new Kittlin in the house!! Not sure what name he's going to end up with. 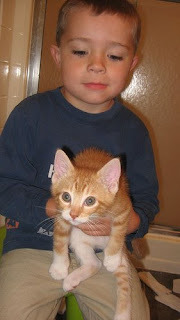 Right now MickeyD's leaning towards "Tiger" but Mr. Stang & I keep calling him "Kittlin", and that's kind of sticking. Miracle of Miracles, he seems to actually LIKE having our little Tasmanian Devil torture him. In fact when he first wakes up in the morning he hears MickeyD's blissful murmerings in his sleep and can't resist the urge to pounce on his playmate and wake him up, ruining any chance of a quiet sleep in. Cute, but maybe not too bright. He was born into a household with FOUR boys and a Rottweiler, so isn't phased in the least by our one little tyrant. Cleo Cat ( soon to arrive at the ripe old age of 15) is more than happy to pass on the role of Crash Test Dummy to a younger, more energetic generation. Besides, the Kittlin still has all of his teeth which makes self-defense easier. It also helps Mr. Stang and I to know that this kitten can somewhat look after himself. He, at least protests loudly when he's being handled too rough. Silent Saint Cleo never would. 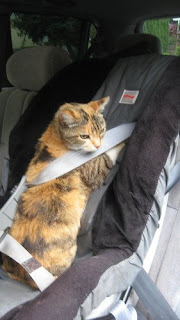 But she's still willing to stand in when MickeD wants to test the installation of his carseat. She's probably disappointed here that we are NOT, in fact taking her for a drive. I've never seen a cat who so loved to drive in cars. Since our last move she's had to content herself with occassional shoulder/stroller rides to the neighborhood park.